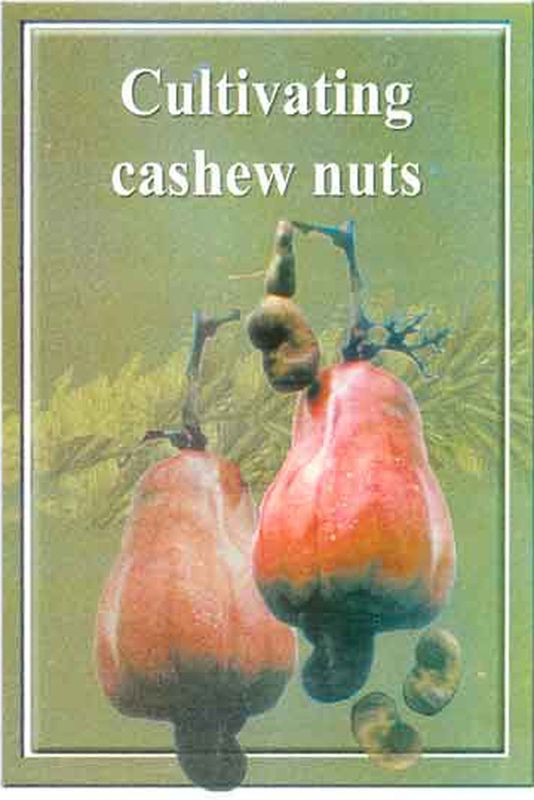 The nut is attached to the lower portion of the cashew apple which is conically shaped. The cashew nut (seed) hangs at the bottom of the apple, and is c-shaped. The cashew seed has within the outside shell the edible kernel or nut. In its raw form the cashew kernel is soft, white and meaty. When roasted it changes colour and taste. Salted, it appeals to the palate as the most delicious nut. Cashew apples and cashew nuts are excellent sources of nutrition. The cashew apple contains five times more vitamin C than an orange and contains more calcium, iron and vitamin B1 than other fruit such as citrus, avocados and bananas. Cashew shell oil extracted from the shells is caustic and causes burns on the skin. The mucous membranes of the mouth and throat are severely affected when it comes into contact with shell oil or the irritating fumes emitted during roasting. The oily shell liquid has many uses. Trees grow well at Pongola, Hluhluwe, Mtubatuba and Makhathini where the climate can be described as warm-subtropical. The Natal coastal region north of Empangeni as well as the Pongola valley are suitable areas for cashew production. Regions in the interior, such as Malelane and Hoedspruit, with warm summers and winters are also suitable. In other subtropical regions of South Africa, where the absolute minimum temperature falls below 7 °C, commercial plantings will be at a high risk. Self-pollination and cross-pollination play an important role in the formation of cashew seed. Seedlings therefore show great variation and no "true to type" trees can be grown from seed. Selected trees should preferably be multiplied by grafting or air layering because vegetative propagation will ensure the best production and quality. Trees that are precocious bearers and grow vigorously are selected. Nuts should weigh between 8 and 9 g with a density of not less than 1,0. Trees with yellow to grey-brown apples have exhibited the most resistance against anthracnose and are associated with the best production. Fresh seeds that sink in water are planted in an upright position in a planting bag containing a loose, sterilised soil mixture. Three to four seeds can be planted directly in the planting hole. The weakest ones are thinned out later and the strongest left to develop further. The seedlings are very susceptible to Phytophthora root rot. The plant bags should be 350 to 400 mm deep, as the tap-root grows very fast and bends around as soon as it touches the bottom. Two grafting techniques, namely side grafting and wedge grafting are practised with success. Grafting should commence as soon as possible (seedlings of 3-4 months old) and planted out in the orchard to prevent the tap-root from bending. Cashew seedlings are grown under shade (45 %) and hardened off before planting in the orchard. It is very important not to disturb the root system during planting. Young trees should be supported for the first 2 to 3 years so that wind will not blow the plants over. Planting distances of 8 x 5 m is recommended. The trees grow vigorously in the first 3 years and as soon as the crowns touch each other alternate trees should be removed until the permanent planting distance of 10 to 12 m is reached. Branches hanging on the ground should be removed because they interfere with harvesting. In other parts of the world cashew trees bear well, in spite of the little attention devoted to the orchards. The application of nitrogen and phosphate are important. Approximately 75 g LAN and 200 g superphosphate per year age of the tree is applied annually with a maximum of 750 g LAN and 2 kg superphosphate. Cashew trees are subject to zinc deficiency that can be treated with 200 g zinc oxide/100 l water applied as a leaf spray. Flowering is affected by weather conditions and also varies from tree to tree, but continues for a period of 3 months. High temperatures lead to earlier flowering. Both male and bisexual flowers are borne on one cluster. The flowers are very susceptible to mildew and control thereof on the leaves and flowers is a prerequisite for good production. Pollination is mostly by insects. After pollination it takes 6 to 8 weeks for the fruit to develop. The nut develops first while the apple develops and enlarges only 2 weeks before fruit fall. Nuts should be harvested as soon as possible, especially under wet conditions and should be dried before storage. Harvested nuts are dried in the sun for a few days. Properly dried nuts can be stored for 2 years before being shelled. Nuts are roasted to discharge the caustic shell oil and acrid fumes. Hand shelling is impossible if the shell oil has not been removed previously. Kernels must be protected from contamination by the shell oil because it would cause blisters in the mouth and throat when eaten. Before the nuts are roasted they must be soaked in waterthe moisture in the shell facilitates the rupturing of the cells containing shell oil and retaining it in the shell. Moisture makes the kernel slightly rubbery and limits breakage of the kernels. The easiest method to wet the shells is to heap the nuts into big piles and to use sprinklers intermittently. Steam may also be used. Shell oil represents about a quarter of the mass of an unshelled nut and approximately equal to that of the kernel. This fluid, that is not an oil as the term "shell oil" indicates, but a mixture of anacardic acid and cardol is the main by-product. India earns more than 200 million dollars a year by exporting 40 to 50 thousand tonnes of cashew kernels and the country's tradelinks are spread over 40 countries. Cashew is a craze in the United States which is by far the largest buyer. The other major purchasers are the eec countries, Japan, Australia, Canada, Hong Kong, Singapore and the countries in the Middle East. Cashew is an excellent choice to grow around the house as a shade tree with healthy fruit (apple) and nuts. Nuts determined the eating habits of prehistoric people. Along with berries and brook water, nuts followed humanity to civilisation. Cashew nuts are packed with proteins, fats and vitamins to a high degree. Proteins, the tissue builders in our system, constitutes a large proportion of cashew contents. The cashew kernel contains 21 % of vegetable protein. Nutritionally they stand on a par with milk, eggs and meat. It also contains a high concentration of much-needed amino acids.